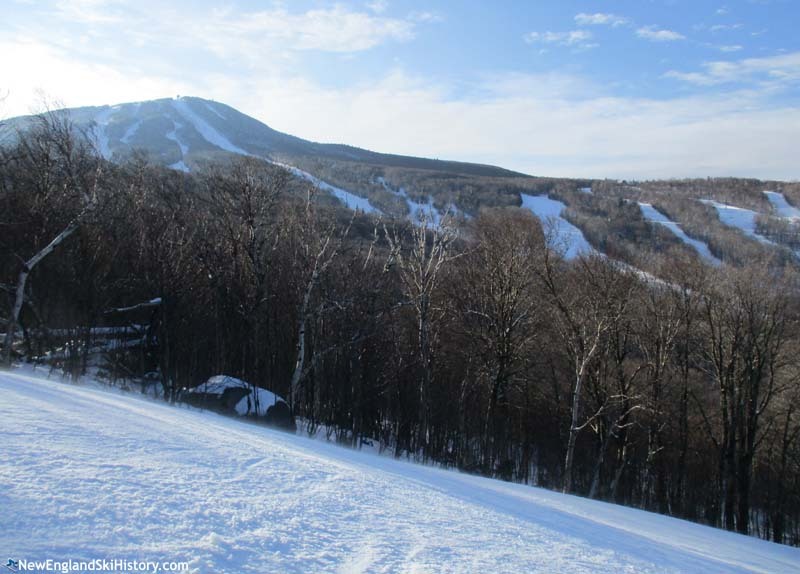 Located north of Killington in the Green Mountains, 3,957 foot Pico Peak is home to one of the longest running large ski areas in New England. Pico's lift served ski history dates back to Thanksgiving Day of 1937, when Brad and Janet Mead opened a rope tow serviced slope on Little Pico. In addition to the slope, a Charley Proctor designed trail, Sunset Schuss, opened on a hike-up basis in early 1938. The nearly 2,000 vertical foot trail was billed as the widest trail in the East with its average 50 foot width. Also in 1938, the Meads recruited Karl Acker from Switzerland to become the Pico ski school director. Two rope tows were reportedly in place for the 1939-40 season. Quickly becoming one of the most popular ski areas in all of New England, Pico invested in a high capacity lift for the 1940-41 season. That January, Pico opened the first T-Bar in the United States, manufactured by Constam. After extensive testing by Roebling, the lift was dedicated on January 12, 1941. 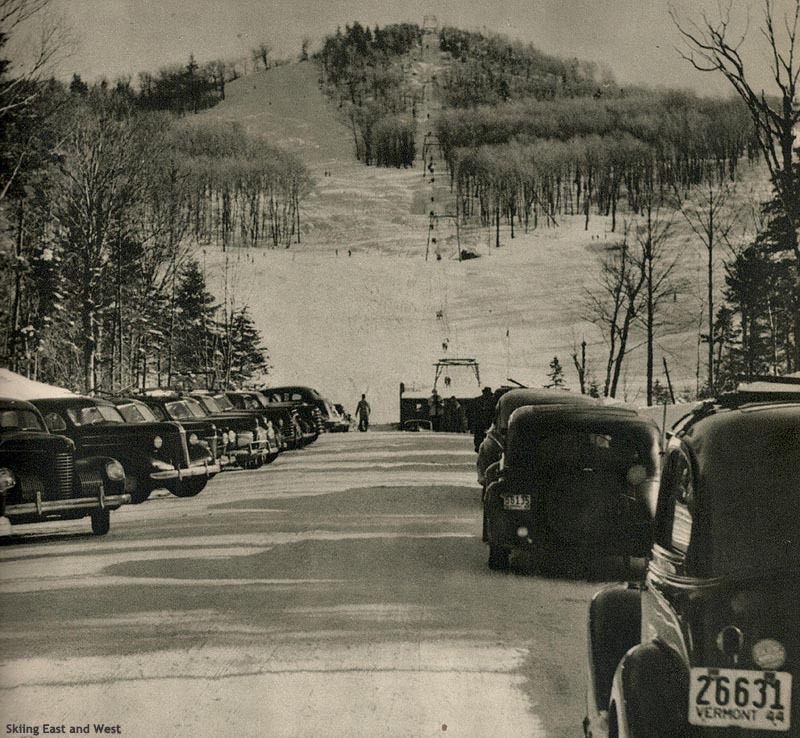 The slopes were smooth for better snow conditions for the 1941-42 season, while a dedicated beginner rope tow was installed. Tragedy struck in 1942, when Brad Mead drowned in a boating accident, leaving Janet to run the ski area. His body was buried near the Sunset Schuss trail. Meanwhile, Karl Acker served in the United States Army's 10th Mountain Division for three years during World War II. For the 1945-46 season further trail smoothing took place and the T-Bar cable was replaced. As the decade progressed, Pico became a go to ski area for hosting large state and regional races. Meanwhile, Janet Mead's daughter Andrea was becoming a world renowned ski racer, competing in the 1948 Winter Olympics at the age of 15. Shortly after marrying David Lawrence, Andrea Mead Lawrence won gold medals in both the Slalom and Giant Slalom events at the 1952 Winter Olympics in Oslo. She narrowly missed the podium in at the 1956 games, coming in 4th in the Giant Slalom. Back in Vermont, ski school director Karl Acker became the manager of Pico circa 1951. About three years later, he and his wife June Acker purchased the ski area, installing a new rope tow for novices for the 1954-55 season. In 1956, work commenced on a new novice area initially known as Gnome's Mound. A new T-Bar was supposed to debut for the 1957-58 season, serving the new 400 foot wide Gnomes Knoll slope. The installation took longer than scheduled and the lift was plagued with problems, forcing a replacement five years later. In an eerie coincidence, another Pico owner died at a young age, when Acker suffered a heart attack in May 1958 at the age of 42. His widow June carried on his vision as owner, bringing in Don Rosenburg as ski school director and manager. In December of 1958, Killington Basin ski area opened just to the south of Pico. For its 25th anniversary season in 1962-63, Pico invested in its largest expansion to date. In addition to base area facility expansion (including a ski-in snack bar), a T-Bar, new slope, and new trail were added. More impressively, the area's first double chairlift was installed. After installing the chairlift, June Acker looked to sell the ski area. 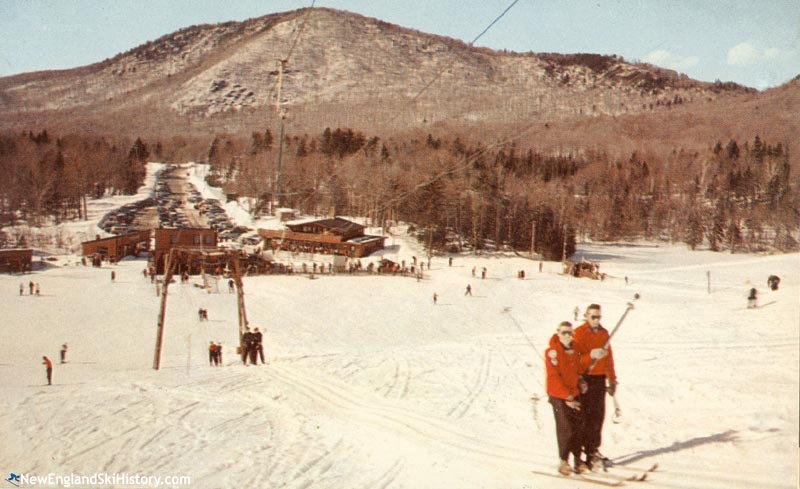 According to Killington A Story of Mountains and Men, Killington acquired an option to purchase Pico in January 1964. Acker later backed out on the deal, not knowing Killington's ownership well enough at the time. In October of 1964, Acker sold the ski area to Bruce and Verlene Belden's Pico Peak Ski Resort, Inc. The new ownership wasted no time in expanding, debuting a summit double chairlift in January of 1966. The Bonanza double chairlift was likely completed for the following season. Not long thereafter, the Outpost area was developed in 1969. Pico achieved another 'first' in 1971-72, when it installed New England's first triple chairlift, replacing the Gnomes Knoll T-Bar. In 1972, Rutland Banker Frank Heald became Pico's marketing director. The famous alpine slide was built on Little Pico in 1981. In 1982, Frank Heald took over as general manager. For its golden anniversary season of 1987-88, Pico installed its first high speed quad, one year after the debut of the technology in New England. With the installation of the Golden Express, Pico was initially part of an elite group including Killington, Mount Snow, and Stowe. 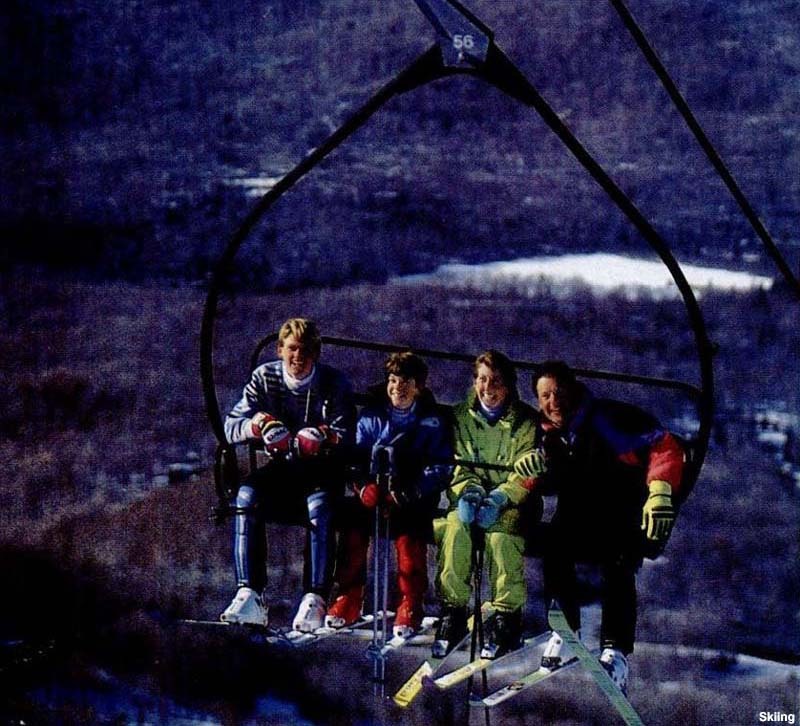 A second high speed quad was installed for the 1988-89 season, reaching the summit. To date, the Summit Express is the newest chairlift installed at Pico. Unfortunately, the investments corresponded with bad winters, putting Pico in jeopardy. 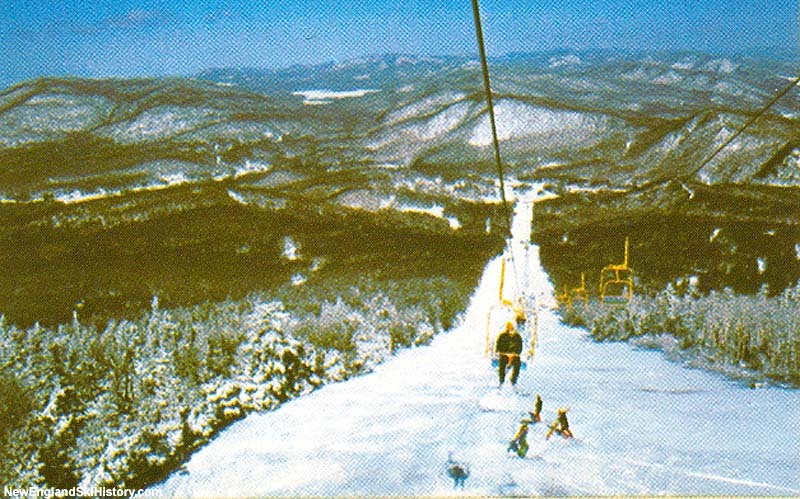 In summer 1989, plans to merge Pico with Killington were announced, with an expected deal completion at the end of the year. While the merger did not close, Killington managed Pico for the 1989-90 and 1990-91 seasons. 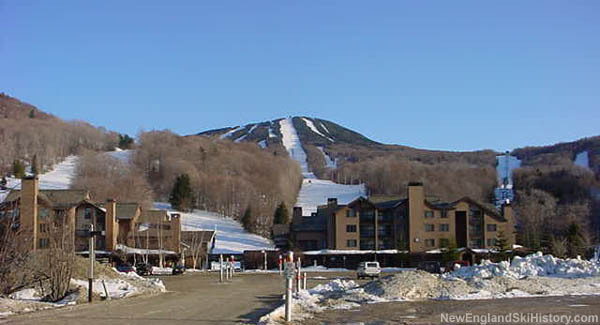 In the early 1990s, plans for a connection to Killington gained traction. Issues with permits and the Appalachian Trail complicated matters. At one point, a $4.7 million sale to Killington was on the table, however it was not successful. In December of 1993, long time Pico shareholders Harold and Edith Herbert purchased the ski area's mortgage from The Howard Bank. In May of 1995, the Herberts foreclosed on Pico and formed Pico Mountain, Inc. in August. From the foreclosure, the Herberts were awarded the assets of the ski area in January of 1996. According to Killington: A Story of Mountains and Men, Pico sold 1,360 acres of Appalachian Trail related land to the National Park Service in March 1996 for $482,335 and Sherburne Pass development rights. Pico Mountain, Inc. filed Chapter 7 bankruptcy July 22, 1996. On December 9, 1996, Pico was purchased by American Skiing Company for $5 million. A landswap agreement between Killington and the State of Vermont was announced during the 1997-98 season and initial work on the Killington-Pico Interconnect started soon thereafter (as well as a re-route of the Applachian Trail). Financial troubles would eventually halt development. On May 11, 2007, Pico and Killington were sold to SP Land Co. for $85.2 million with Powdr Corp. taking over operations. In January of 2012, Pico announced alpine slide operations would cease after some three decades of summer use. On March 1, 2018, Powdr Corp announced RFID ticketing would be installed at Pico for the 2018-19 season. "I remember as a teenager trying to ski back to our lodge from Pico and missing the turn off, when the lifts had just stopped. We had to climb up a rock wall to cut over, only to find 2 alpine slides separating us from the trail to the lodge. So, we climbed in and out of 2 Alpine slides and made it back with some great stories. ...So many fun memories of growing up skiing at Pico in the mid 70's and 80's." "I worked at Pico in the winter of 1962 when it was a small but fun mountain to ski and enjoy the sport. I remember announcing skiing conditions each week over the radio to NYC and the surrounding area. I loved the experience!" "MY DAD WAS ON THE SKI PATROL FOR PICO IN THE 70'S AND WE GO EVERY WEEKEND SKIING AS A FAMILY AS HE WORKED THE MOUNTAIN WITH THE OTHER SKI PATROLERS. PLEASENT MEMORIES OF THE DAYS. " "Our family would ski at Pico every weekend. My dad would make a big jug of hot chocolate and leave it on the deck for everyone to enjoy. We affectionately refer to it as 'Bob's Hot Chocolate'."